Discussion in 'Grappling Technique' started by Grey Kid, May 24, 2008. Just a question on shooting in with the double leg. I've wrestled for about 1 year now, and have always stood in an orthodox mma/muay thai stance, with right leg back left leg forward. 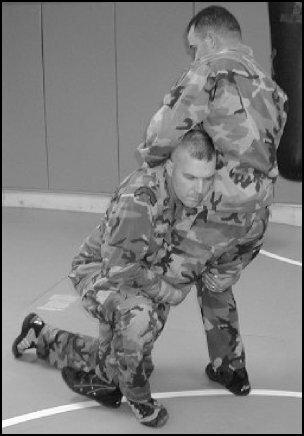 When I shoot in for a double leg, I penetrate with my left lead leg, but put on head over onto my left side (opponent's right side). I then scoop with my arms and drive with my head and torso. Lately, I've noticed more and more that other wrestlers/mma fighters who fight from an orthodox stance, tend to place their head on their right side (opponent's left) when going for the double leg. I tried this for a few weeks but couldn't get the hang of it. I find that when I place on my head against my opponent's left, I don't get the driving motion as easily as what I'm used to. So my question is this - should I try to change what I am used to? Is it a bad habit, and if so, why? I should clarify that I goto freestyle wrestling classes specifically for mma, not for pure wrestling. This is a nice static picture of a double leg. Notice how the head is on the same side as the upright leg. If your head was on the other side, then you would have it on the wrong side. As long as you do the takedown correctly it doesn't matter which side you attack. If you like to attack the opponents right side, try using it to counter an overhand right. BTW, square your hips up a bit. Iosephus was right even for MMA.